Chapel & Gateway, Hope Cemetery - Dear Sis! A feature of permanent value and of special significance to every one having pride in the cemetery and its appointments, which calls for special mention in this report, is the addition of the Memorial entrance gates near Curtis Chapel, the gift of the late Mrs. Solomon Nixon, who, by will, provided the fund for their erection. The design for this memorial was the production of The Gorham Company, of New York; the stone was furnished by The Norcross Company, of Worcester; the iron work was provided and installed by The Gorham Company, and the engineering department of the City of Worcester, under the supervision of Frederick A. McClure, was responsible for the details of construction. The gate is altogether a most creditable production artistically, and a fitting memorial to the generous donor no less than to her husband, in whose name the gift was made. A suitable bronze tablet has been placed as a permanent acknowledgment of the gratitude of the citizens of Worcester. Postmark: 12/15/1910 - Worcester, Mass. The limited space on a postcard and the public nature of their messages often leads senders to write elliptically. This particular card is quite the exception. We know that Grais was writing to her sister, that the two of them were planning joint gifts for Christmas (the card was postmarked on December 15th), and even what gifts they had in mind. The mystery then is whether ma got the sweater, pa got the pin (or charm) and Nellie got the comb. Grais Florence Poole was born on July 4, 1890 in New Salem, Massachusetts. The “Nellie” she mentions is apparently Nellie May (Simonds) Burrage, although the early connection between them is not clear. However, three years after Nellie died in 1941, Grais married Nellie’s widower, James Burrage, who died in 1947. Grais died in 1968 and is buried in North New Salem Cemetery, along with her mother, father, and husband. Blanche Poole was born on August 19, 1880 and at the time of the 1910 Federal Census was working as a servant for Rufus P. and Sarah S. Walker, who lived at the address on this card. On March 8, 1914, at the age of 33, she married Milton M. McIntyre, a widower with one son. After Milton died in 1925, Blanche returned to live with her parents in New Salem. She died in 1965 and is buried alongside her husband in South Cemetery, Orange, Massachusetts. Special thanks to Bill Wallace, Executive Director of the Worcester Historical Museum, for his guidance on researching this topic and for permission to use his words in the blog. Tagged: Worcester, The Hugh C. Leighton Co. This little jewel box of a building, “Curtis Chapel” at Hope Cemetery, was designed by noted Worcester architect Stephen Earle, dedicated on January 1, 1891 and demolished by the City of Worcester in 1962. It was the gift of Albert W. Curtis, one of the original Commissioners of Hope Cemetery and an owner of Curtis & Marble, a local textile machine company. 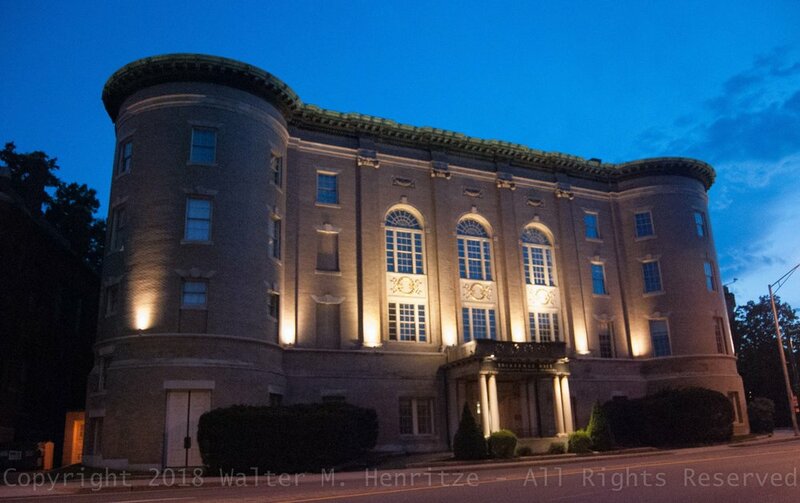 According to Bill Wallace, Executive Director of the Worcester Historical Museum, "The chapel stood just inside the currently unused entrance at the top of the rise as you approach from Webster Square. The 'new' gates [seen above] are early 20th century replacements, built by the Norcross Brothers in the style of the chapel." Postmark: 03/24/1906 - Millbury Mass. Mama arrived home last night found everything all O.K. Punctuation on postcards from the early 20th century is often rather sparse. In this case, the lack of a dash, comma or period leads to some difficulty in understanding the true intent of the message. It might read, "Mama - Arrived home last night. Found everything all O.K." or "Mama arrived home last night (and) found everything all O.K." The correct interpretation is made clear by details provided below about the sender and recipient, neither of whom is "Mama." On June 19, 1900 the Federal census for that year records Marion Cullina living with her mother and five siblings in the town of Sutton, Massachusetts, roughly 10 miles from Worcester. Six years later, at the time this card was sent, she was 12 years old and, as the youngest member of a large family, was likely the one designated to communicate with her sister Lizzie. Elizabeth ("Lizzie") Cullina was the sixth of ten children born to Michael and Ellen (Powers) Cullina. Her date of birth was August 11, 1874 and she died in May 1964. This card was almost certainly sent after a visit by her mother to Worcester where Lizzie (a "saleslady") lived at the time with her brother Edmund (a carpenter) and sister Nellie (a housekeeper). A. C. Bosselman & Co., New York. Special thanks to Bill Wallace for his guidance on researching this topic, for essentially all of the basic information about Curtis Chapel (which is almost invisible on the Web), and for permission to use his words in the blog. Also, thanks to Larry Abramoff for providing the postcard itself. Worcester Memorial Auditorium, officially dedicated in 1933, was built to honor the city's World War I veterans. It was designed by the architects Lucius W. Briggs of Worcester and Frederic C. Hirons of New York City. 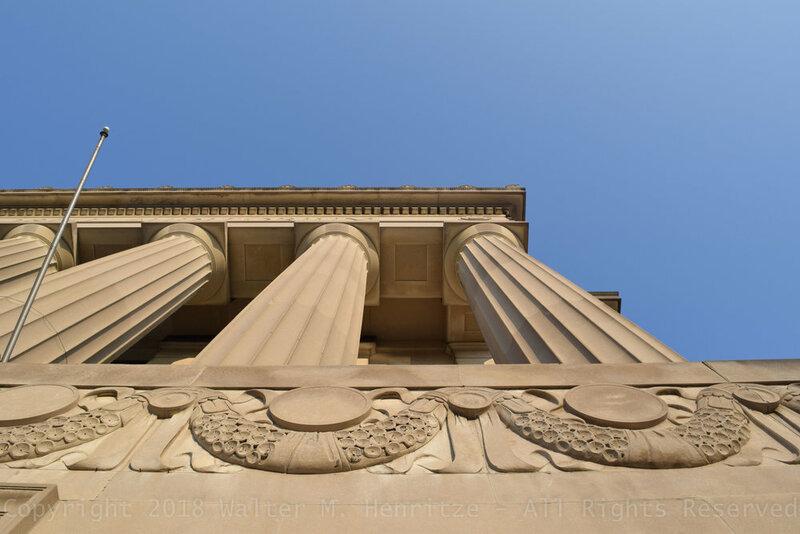 Although the columns on this building announce its Classical Revival style, the setting on a steep hill leading up Highland Street and the low extensions on the north and south sides detract somewhat from its "classic" proportions. Nonetheless, its presence on Lincoln Square is weighty and dignified. On the upper element of the entablature are inscribed these words. Both the interior and exterior of the building are adorned with many Art Deco features, including the two examples shown above. It also houses the mighty Kimball Pipe Organ, a magnificent instrument equipped with 6,853 pipes over 107 ranks that, quite unlike so many other vintage organs around the world, has not been modified since it debuted here in 1933. This imposing building also holds within it a stunning set of three large murals painted by Leon Kroll. It is impossible to grasp the scale and impact of Kroll's work without visiting the site, but the detail images below may give a sense of his ambition for this project. In a tragic irony, these murals were dedicated on May 28, 1941, barely six months prior to the bombing at Pearl Harbor which brought the United States into the Second World War. Over the course of the last 85 years, the Auditorium has hosted a wide range of events, from civic celebrations and high school graduations to Holy Cross basketball games and roller derby competitions. Among the almost uncountable number of concerts held here was Bob Dylan's Rolling Thunder Review in 1975 (at which Joan Baez and Joni Mitchell also appeared). Today the building sits empty, unused since 1999, with an uncertain future. However, a substantial city-funded study is now underway to determine what can and should be done to preserve it for future generations. "TICHNOR QUALITY VIEWS" REG U.S. PAT. OFF. MADE ONLY BY TICHNOR BROS., INC. BOSTON, MASS. Many thanks to Larry Haley for information on the proper architectural terminology. 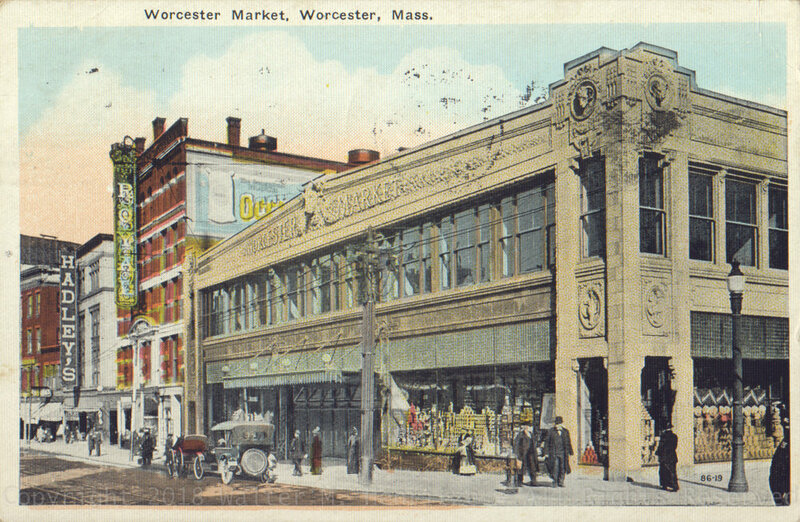 The Worcester Market, an ornately adorned Classical Revival style building, was constructed by the J. W. Bishop Company from a design by its employee Oreste Ziroli, an Italian immigrant. It was completed in 1914 and opened for business in 1915. 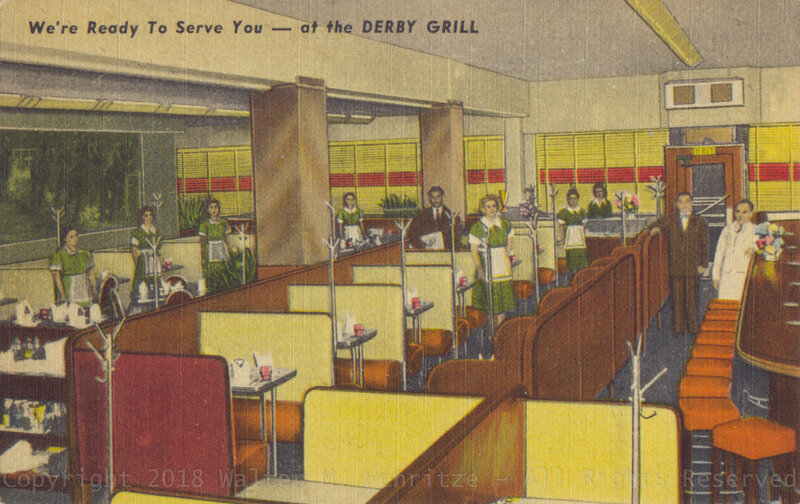 At that time, it was reported to be the largest food market in the United States, with 25,000 square feet of retail space on the first floor and storage space above and below connected to the each product counter by elevators. Initially built for a regional grocer, Fayette Asyril Amidon, the building subsequently served as a store location for the Brockleman Bros. and Stop & Shop chains, before closing as a market in the mid-1960's. Thereafter, it was used for about a decade by Morgan Memorial Goodwill Industries as a store and then, after substantial renovation, was leased to the state for various departmental offices. The building was closed in 2014 and today has an uncertain future. Still, many people remember the Worcester Market in its heyday, including Mrs. Beverly (Marsden) Strom who said recently, "(I went) there every Friday night shopping with my mother and father after having a hamburger at White Tower nearby. It was the only market in town at the time until United Fruit opened up across the street." That was a different world. We are enjoying a week with Belle - having splendid time - B & W send love to you and your mother. Postmark: 09/09/1926 - Worcester Mass. Who were the B(elle) & W mentioned in the message on this card? What relationship did they have to the Sender and Recipient? Were they family or just close friends? One or the other most certainly. Louise Benner Curling was born in 1872 and, at the time of the 1930 Federal census, lived in Thomaston, Maine, just a few miles down Route 1 from the Recipient of this card. She married John Hewett in 1906 and it appears that they had no children. Louise died in 1951 and is buried in the Thomaston Village Cemetery. Maude Louise Hupper was born in 1880 to Sidney G. & Eloise T. Hupper. According to the 1920 Federal census, at age 37 she was single and living in Rockland, Maine with her parents. At the time this card was sent, six years later, she was still single and thereafter never married. Maude died in 1971 at the age of 90 and is buried in Achorn Cemetery in Rockland, Maine. THE WORCESTER MARKET, the largest of its kind in the United States. The entire plant has an area of 90,000 sq. ft. and a storage capacity of 1500 tons. The actual floor space, all on one floor, for the convenience of patrons, is 25,000 sq. ft.
Special thanks to Bill Trutor for his research assistance on this topic. Franklin Square Theatre - F.L.C. 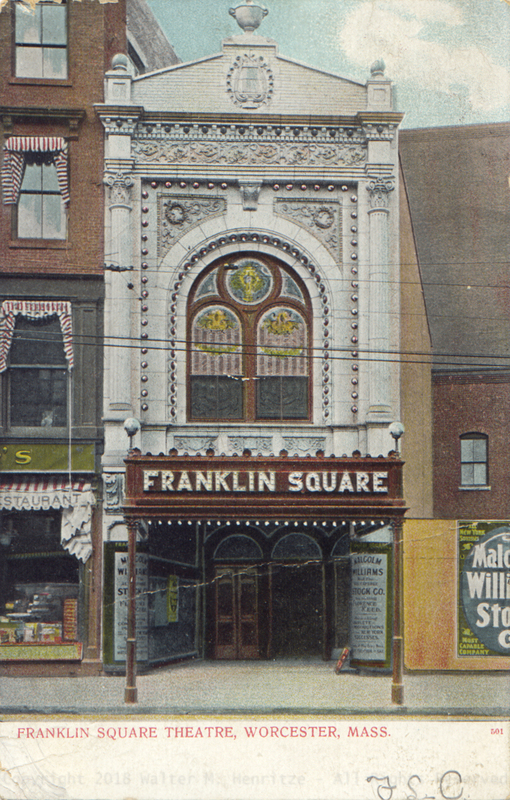 The Franklin Square Theatre at 2 Southbridge Street was built by Ransom Clarke Taylor from a design by the local firm of Cutting, Carleton & Cutting and opened for business in 1904. The hall included orchestra seating for 658 people, a balcony and boxes for 459, and a gallery for 519. At that time, admission prices ranged from $1.50 for the best orchestra seats to $0.25 for the gallery. In the first two decades of its existence, the theater hosted local and traveling performers as well as Broadway touring companies. However, in 1926 then-owner Sylvester Z. Poli developed a larger adjacent building (Poli's Palace) to cash in on the growing craze for moving pictures and this original structure was relegated to secondary uses. Today, thanks primarily to the imaginative efforts of Ed Madaus and Paul Demoga, along with substantial contributions from many players in Worcester, this building has been restored and is now being used as part of The Hanover Theatre complex. Unfortunately, the original stained glass windows that once graced the facade of this building were lost or stolen at some point. Perhaps someone knows where they are now? Postmark: 08/20/1907 - South Berlin Mass. This card was postmarked in a town less than five miles from where the recipient lived and has, essentially, no content. Maybe it was sent, as so many postcards at the time were, simply as part of an exchange between people who collected the cards. Picture postcard collecting was a mania in the early 1900's and hundreds of millions of cards were mailed annually until the fad crashed at the beginning of the First World War. At best, given only the three initials on the front of the card, we may surmise that the sender was thoughtful . . . but he or she will probably remain forever unknown to us. Donald Pierce Lyford was born on February 11, 1894 in Spencer, Massachusetts to Taylor C. Lyford and Nellie L. (Pierce) Lyford. He married in 1917 and had one son, but at the time of the 1930 census was divorced and living with his parents. Later in life it appears that he married Dorothy Avis Branigan. She died in 1969, he died in 1978, and they are both (Donald & Dorothy) buried at Prospect Hill Cemetery in Uxbridge, Massachusetts. A.C. Besselman & Co., New York. Classical High School was completed in 1871 from a design by the firm of Gambrill and Richardson of New York. This grand, soaring structure reflected the vision of H. H. (Henry Hobson) Richardson, whose signature style came to be called "Richardson Romanesque." The Worcester firm of Norcross Brothers Contractors and Builders was engaged to construct the new school and subsequently worked with Richardson on many other projects throughout New England and beyond. In addition to classrooms, meeting spaces, and offices, it included a gymnasium in the basement and a large hall on the third floor, measuring 76' x 62'. The building faced east on what is now called Maple Terrace (between Maple and Walnut Streets) but in 1966 was demolished to make way for the new headquarters of Paul Revere Life Insurance Company. In 1943, most able-bodied young men in their late teens would have been called up for service in a rapidly escalating war effort. And, at a time when the country was rationing every imaginable product, a source of locally grown food would have been very important. So what led these "boys" to put off their responsibilities? Perhaps, considering the circumstances, the discipline of a senior man in the house was absent. Whatever the reason, Mrs. Beauregard seems none too happy about the delay . . . and rightly so. Eudora Hazel Judson Button (Beebe) Beauregard was born on May 22, 1895 in Pawtucket, Rhode Island. Barely a week after turning 17, on May 31, 1912, she married Reginald Ambrose Judson in Worcester, Massachusetts. However, they were divorced on October 19, 1916 and soon thereafter she married Edwin/Edward H. Button, with whom she had three children, Edward, Lillian and Phyllis. Edward Sr. died on July 18, 1925 and she then married Harry Joseph Beauregard in Boston on May 8, 1926. Eudora died on February 12, 1993 (at age 97) and is buried beside her second and third husbands in Hope Cemetery, Worcester, Massachusetts. Onnie O. Wright married Edna McKown in 1916 and at the time of the 1920 census they were recorded as having one son, Herbert. However, the West Virginia Marriages Index shows that on October 29, 1923 he married Anna A. Hawkins and at the time of the 1940 Federal census the two were living in Spencer, West Virginia with their son, 15-year old Olsten. It seems very unlikely that there were two Onnie O. Wrights of the same age at the same time in that area, so one must assume that Anna was the second wife to whom this card was addressed. Published by A. P. Lundborg, Worcester, Mass. Jonas Clark Hall - I like my work very much. The cornerstone of Jonas Clark Hall at Clark University was laid on October 22, 1887. The next day in The New York Times it was reported that "The building ... is 205 feet long by 65 feet deep. It is composed of a central structure five stories high, flanked on either side by four-story wings. The middle section is surmounted by a clock tower which rises to a height of 102 feet, while at the extreme end of the wings are corner towers 76 feet high." 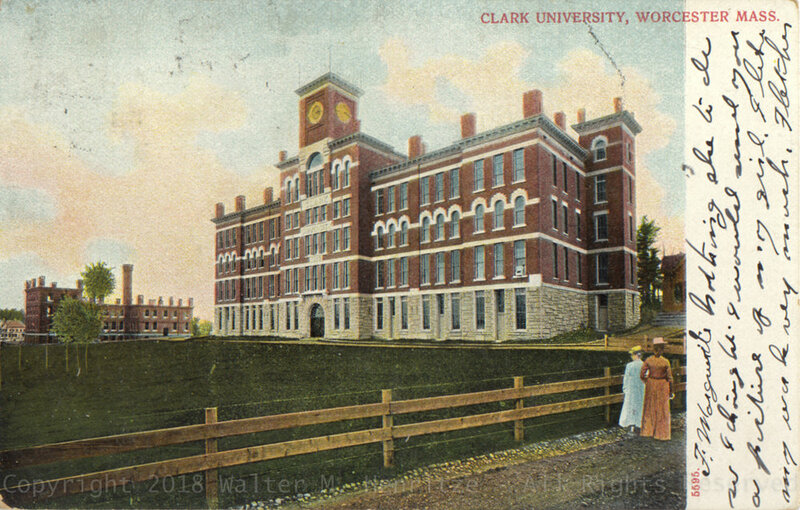 Clark University was the brainchild of Jonas Gilman Clark, who organized a group of prominent local citizens to petition the state legislature and then personally donated $1,000,000 (roughly $25,000,000 in current dollars) to establish the school. This building was the first erected on campus and was designed by architect Stephen C. Earle in the Classical Revival style. Jonas Clark Hall has today been joined by many other buildings on the expanded campus but is still the centerpiece of the University. Seen from the front gates at 950 Main Street, it announces both the school itself and the year of its founding in bold granite lettering. 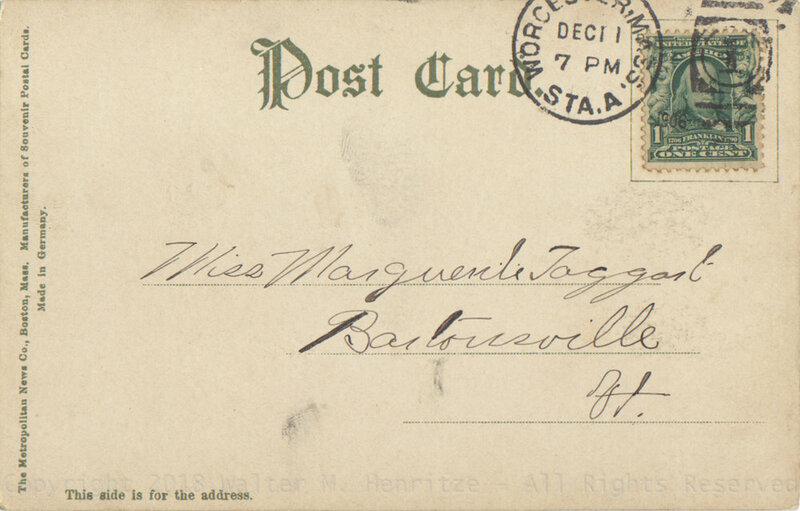 Postmark: 12/11/1906 - Worcester Mass. The paucity of letter-forms on any postcard often makes it difficult to tease out some parts of the written content. That is certainly the case here. Is the card signed, "Father" or "Fletcher?" We know from the census that Marguerite's father was living with his family in 1900 and 1920, but was not recorded there in 1910. However, since he was a railroad conductor, he might well have been missed during that particular census and no doubt traveled through Worcester on a regular basis. We may speculate that the sender was Marguerite's father, as above, but if that's not the case, then "Fletcher" will, no doubt, forever remain an unknown figure in this context. Marguerite Esther Taggart, the daughter of Charles and Jennie Taggart, was born on March 23, 1891 in North Walpole, New Hampshire. She married Frank Snow on August 12, 1913 and at the time of the 1930 Federal census was living with him in Rockingham, Windham, Vermont. He owned a General Store, where she worked as a Sales Clerk, and they had one daughter, Marguerit Virginia Snow, born October 23, 1917. The Metropolitan News Co., Boston Mass. Manufacturers of Souvenir Postal Cards. Boy's Club - I have no pets now . . . The Worcester Boy's Club at Lincoln Square was opened in 1930 to serve the Club's rapidly expanding membership in the city. After a fundraising effort that collected almost $450,000 (roughly $6.5 million in current dollars) the building was constructed on property that had previously been the site of Salisbury Mansion, which was moved just up the hill and now sits at 40 Highland Street. The World War I memorial in front of the Club was also later relocated slightly and its left edge is now just visible in the far right side of the image below. The architectural firm for this simplified Neo-Georgian structure was Frost, Chamberlain and Edwards, a well-known local firm that also designed many other significant buildings in the city. After the Boy's Club abandoned the building, it was incorporated into the neighboring "Voke School" complex . . . which explains, but does not excuse, the ugly block lettering seen in the image above. In 2006, the city completed a new Worcester Technical High School and moved all of its vocational programs to that facility. Since that time, numerous attempts have been made to entice a developer for this building but it currently remains closed. Thanks for the lovely card. I was glad to hear from you again. I have no pets now as my little dog died. Postmark: 08/11/1944 - Worcester Mass. According to the City Assessor, this building was completed in 1915, but that's when the other Boy's Club on Ionic Avenue was opened. The Assessor also says that it's located at 16 Salisbury Street (which must be correct), although none of the property lines currently abut that street. The Massachusetts Cultural Resource Information System provides a definitive opening date of 1930 and gives the location simply as Lincoln Square. Knowing that the recipient of this card was 15 years old at the time suggests that sender was roughly the same age. This is further affirmed by the direct, unemotional, and plainspoken report, "I have no pets now as my little dog died." 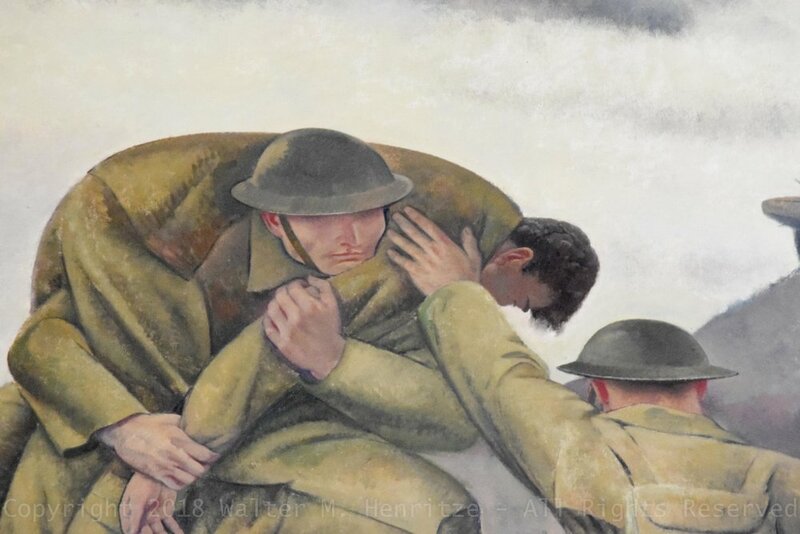 For a young teen, that event was probably quite heartbreaking but, in the midst of a global war, the daily drumbeat of reported deaths must have changed perspectives for everyone who remained at home . . . waiting. Marilyn Stevens appears in the 1940 Federal Census, residing with her father, mother and older brother in Beckemeyer, Illinois. She was born on December 31, 1927 and, based on all evidence, lived there for her entire life. Her brother John joined the U.S. Army in 1943 and was almost certainly serving overseas when this card was sent. Marilyn (Stevens) Bromley died in 2002, just shy of her 75th birthday and is buried in Saint Anthony's Cemetery, Beckemeyer, Illinois. PUB. BY PERKINS & BUTLER INC., WORCESTER MASS. MADE ONLY BY TICHNOR BROS. INC., BOSTON, MASS.